If you are looking for a environmentally friendly media center, you can’t get much better than the Tranquil PC ixL. Its processor is powerful enough to handle any media you throw at it, yet is still able to run without fans. If you throw in a solid state hard drive (SSD), then your new computer will have no moving parts. It will be completely silent. Its visual styling is sleek and modern, while it is small enough to not draw too much attention. Simply put, this is a computer meant to be a media center. Despite having a Intel Core i3 processor clocked in at nearly 3 GHz, the Tranquil PC ixL consumes only 20W of power at idle. That is very low for a desktop computer. The high-powered CPU means that this computer will be able to handle any media you throw at it, from standard definition to 1080P. Despite this power, this is a fanless machine. All the heat is dissipated via heat sinks built in to the case. So rather than have that awful whine that so often accompanies your computers, you will b. presented with silence. Two choices are offered for storage: a normal hard drive with 500GB, or an SSD with 64GB. While the normal hard drive offers far more space to store your media, it is noisy. The fans are not the only source of noise pollution. No, often it is the hard drive. The SSD is completely silent, and it is faster that the normal hard drive. If you elect for the SSD, then your computer will be completely silent. 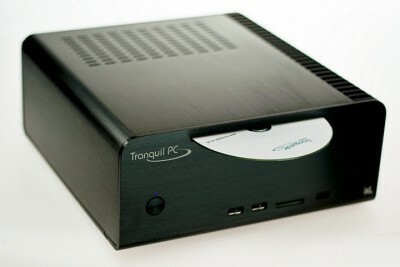 The Tranquil PC ixL comes in a 240 x 250 x 110mm chassis. That is smaller than most other small form factor PCs. It is also much nicer looking, due to this being a premium machine. The case is brushed metal black, with the large heat dissipating grills located symmetrically on the sides. The front if flat with only holes for your various USB ports, SD cards, and your optical drive. The styling gives it a high quality sturdy look. As would be expected for a media center, the Tranquil PC ixL contains an HDMI port. This means that you can push true HD to your television. A feature not included in every machine, however, is its IR receiver. IR is the standard technology for remote controls. By supporting this, the ixL opens a world of couch-surfing potential. Rather than interfacing with it via a mouse and keyboard, you can sit back and relax on the couch and browse your media with a remote, like you do with your DVR. Finally, for those who want it, Tranquil PC offers laser customization. You can have your name of favorite phrase carved right on the front of the device. For those looking for a good, premium green computer, you can’t get much better than the Tranquil PC ixL. Its features are second to none, while its design allows it to be nearly silent. If you are looking for a media center, this may be the device for you. Pricing for a basic system starts at £389.00 plus VAT.